Following on from the work done for the Wind Datalogger and the Latrine Logger, we are bringing these ideas together to create a Renewable Energy Resource Monitor. 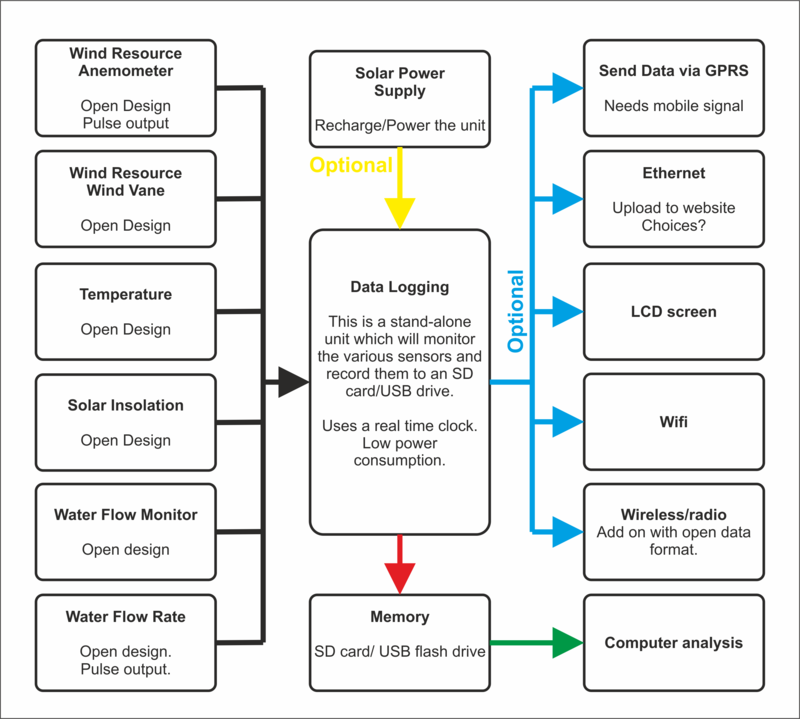 This is a Arduino-based data-logger which has a range of sensors which can measure different weather resources which relate to renewable energy generators. The end result is low-cost and open-source for accessibility for all. This post explains the problem and will contain information on the prototype as it develops. This project will be open-source and PCB design, software and hardware designs are available on GITHUB. If a developer is installing a number of very expensive large wind turbines or other renewable energy project then they must be VERY confident about the resource data. The data must be robust and reliable and the developer will be willing to spend a lot of money on accurate industrial equipment to have lots of confidence in the data. In a remote rural location it might be that just a single small wind turbine or solar PV module could provide low but vital levels of electrification. Small systems such as this cost in the region of a few hundred dollars, so a high expense to monitor the resource would not be a sensible investment. Hence this data is not usually recorded – the cost of recording the data outweighs the cost of the installation. This can lead to failed projects which have not been installed in appropriate locations. This project intends to overcome this barrier by providing a low-cost, reusable, open-source renewable resource recording unit which can be left in a remote location to record data and help improve resource assessments. The prototypes are based upon the DataDuino, an Arduino-based logger unit with SD card holder and real time clock. This is based in turn on the ATMEGA328 programmed with the Arduino Uno bootloader.This requires a programming lead (such as the FTDI USB/Serial lead), which is a hassle to have. I am also looking at using the ATMEGA32U4 programmed with the Arduino Leonardo bootloader. This has USB built in to the IC and so can be updated with a standard USB cable. The cost difference may affect the final choice. A low-cost pulse anemometer is used here, but any anemometer can be used. More details are available on the wind logger page. A low-cost stepped voltage wind vane is used here, but any analogue output wind vane can be used. Temperature is very useful to monitor for big-gas and solar thermal systems. A simple thermistor is used in this design, but a 1-wire digital sensor could also be used. More information on temperature sensing is available here. This is a work-in-progress. This will be a plug-in sensor to monitor solar irradiance. This is useful for both solar PV and solar thermal applications. This is based upon a 555-timer capacitance sensor. This was developed as part of the latrine logger project, more information is available here, on the latrine logger page. This is a work-in progress, but any pulse output flow monitor could be used. Some kind of propeller spun by the water flowing would give a pulse reading of the flowrate. The data is stored onto an SD card, or similar memory. This is stored in a ‘human readable’ format as a .csv list with a timestamp. This data should be easy to analyse to create things like wind roses and wind speed frequency distributions. This will be multi-platform and run as a stand alone program. At present the prototype code is being written in Python. We would like the unit to be very low power and be installed at any location. Either batteries or some form of battery and solar PV backup can be used. More information on this is written in the wind logger post. An ‘off the shelf’ solution of a solar charger shield, such as this from Seeed Studio. This uses the CN3083 IC, which is quite difficult to find in the UK (the CN indicates a Chinese part number). BQ24210, £1.92 +VAT. 800mA Difficult to solder package. LTC1734, £1.43 + VAT. SOT23 package. 200-700mA Not for solar input. LTC3105, £4.72 +VAT. 400mA. Step-up boost converter. For solar input. Here is an intersting article on designing a Solar – Li Ion charger from EETimes. This is a work-in-progress and will be updated when some of these ICs have been tested out. The additional costs for adding the solar charge regulation are the solar PV module (1W 5V module is around £3-5). A Li Ion battery is also required, costing between £6 and £12, which adds a high price to the unit. Small plug/socket connectors are also required for the solar and battery connections. Please see this blog post for details of testing these units. These units will be installed in remote locations without access to a mains power supply nor internet connection. Most remote areas have mobile phone access now, so a good add-on would be a mobile network based data upload. These are available as shields for the Arduino. This will be tested as an add-on but could also be included into the final version. A SIMcom SIM900 unit was purchased from iTEad Studio, around $37 + delivery. This was connected to an Arduino Leonardo with just the GND, 5V, Tx and Rx pins. My first test was to write conmands to the device. Please see my blog post here for more information about testing these ideas. Data can be sent to some form of ethernet connection. A simple and low-cost way to do this would be through a Raspberry Pi. Data can be sent via a serial connection (RS485 in noisy environments). This will probably be done using the OpenEnergyMonitor project display and visualisation program. This will be a low-power LCD unit to display what is happening. This add-on would be useful for ‘in the field’ set-up and testing, although would consume more power so would not be good for long term installation. Simple WiFi units can be used to connect to a WiFi connection and send data using that method. A wireless data connection can also be used to send data back to some kind of base station. We have used CISECOs XRF units for this with a great range and reliable connection. These are just £12 each and are zigbee shaped. We are working on the prototype unit at the moment. Results for testing this unit will be posted here. The PCB should fit into a standard waterproof enclosure, such as this from CPC. This is an IP65 junction box which is readily available and low cost (around £3 each). The maximum internal dimension is 100mm x 100mm, so the PCB should be smaller than that, but with holes to fit mounting holes in the box. Up to 4 analog and 4 digital sensors can be attached to this unit. These will plug in to the board, but be held in place with a bolted connection to ensure they do not come free. Ensure SD card is easily removable.